Put the flours in the food processor and add at least 2-3 tablespoons of olive oil, salt, sugar and the yeast. Start the food processor and pour in enough warm water to make a dough. Ensure that the dough is not too tough but not too sticky to touch. Leave it in the processor for 5 mins and then pulse it a few more times to make the dough complete. Take the dough out and put it in a greased bowl and leave it to rise for 4-5 hours. Spray some olive oil on the top so that the dough doesnt dry out. Tip: If the weather is too cold, then put the bowl inside the oven with the pilot light on. You can even cover it with a simple sweater to ensure fast rising. Once the dough is risen, split the dough. The above quantity of flour makes 2 pizza pies. Lightly flour your pans and start to spread the dough to make your pies. Start in the center and work your way out to the edges. Tip: Use your fingers to do the magic to create artisan pizza. Avoid using roller pins since that will roll out all the air and fluff from your pizza. Once you spread out your pie, lightly brush olive oil on top (or use a spray) and finally cover the crust with fresh ground black pepper. Leave it and let the pie rise for another 5 minutes. Now your pie is ready for topping. 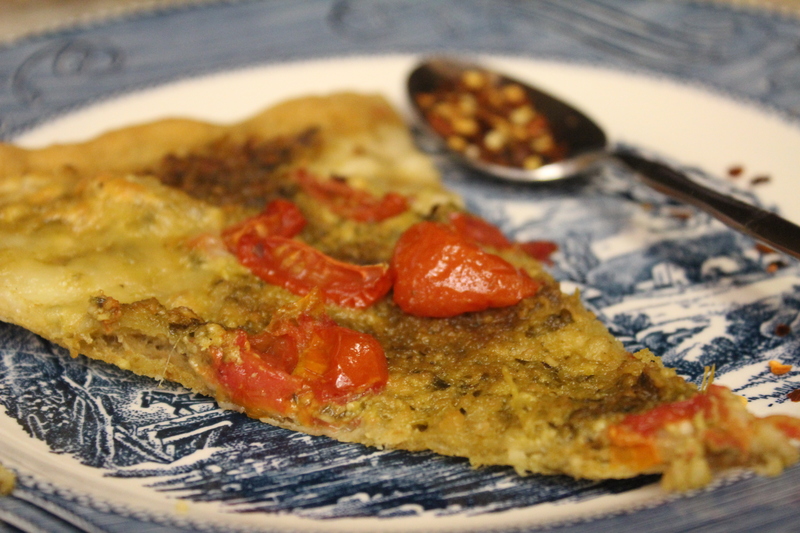 For this simple pizza, first spread out the pesto sauce. I like a fair amount of pesto sauce since that is the base. Cut the mozzarella balls into thick spheres. Place those on the pie and then finally sprinkle tomatoes evenly on top. Preheat your oven for 450°. Place your pie in the oven and leave it to cook for at least 18-20 minutes. Your pizza is ready to eat. 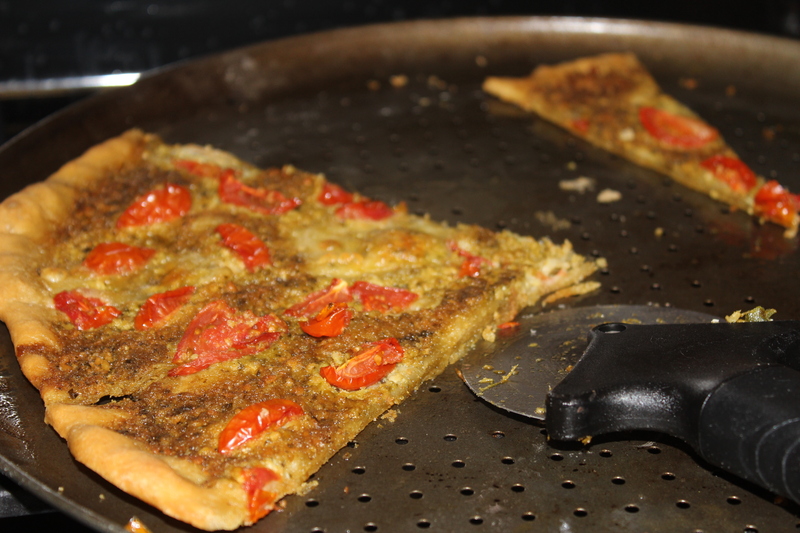 What are your favorite toppings that you like in a pesto pizza? Garlic? Sun dried Tomatoes? Tell me more by adding a comment.